The housing crisis facing San Francisco and many other American cities — driven by changing demographics, a booming economy, and high development costs — may be addressed by creating an alternative to the disappearing residential hotels. For much of American history, the residential hotel served a vital need, providing basic, market-rate, affordable urban housing. Located in central locations, residential hotels served tens of thousands of people of varied means and backgrounds. But starting in the second half of the 20th century, cities began systematically destroying residential hotels. As these dwellings disappeared, waves of displaced citizens found themselves squeezed by the high cost of conventional housing. Demography: Record numbers of highly mobile, single people are in need of flexible, affordable housing. Economy: The large number of jobs in urban areas, combined with a severe housing shortage, has led to astronomical real estate prices. These conditions have created a critical need to rapidly increase the housing supply for single workers. Increasing housing options for singles can free up larger units for families, and reduce the housing costs across all segments. Technology: Advances in modular, prefabricated construction can produce a new type of safe, high quality residences that can be built rapidly and economically. San Francisco is a city that once abounded with residential hotels, many of which were destroyed or repurposed in the last 60 years. Replacing and redesigning these lost hotel units would greatly help to relieve its current housing crisis. Using San Francisco as a case study, this paper examines the historic role of residential hotels, their decline and disappearance, and how the introduction of an alternative might provide safe, convenient and affordable housing to singles in San Francisco and other major cities. Residential hotels have existed for most of America’s history. Called rooming houses, boarding houses or simply hotels, residential hotels typically provided an affordable small room and shared bathroom. Meals were often provided in a common dining area. Left: the dining hall from New Delmonico, an upscale residential hotel on Geary St. 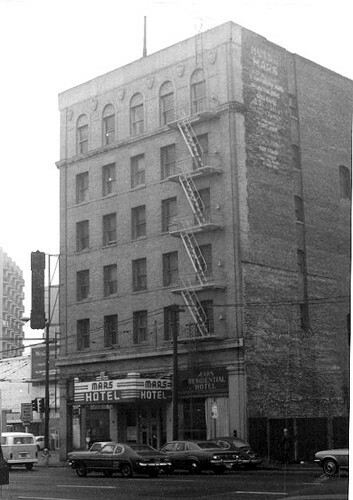 Right: Before being razed for the Moscone Center, residential hotels lined Third Street. Left: The majority of San Francisco’s residential hotels provided low cost accommodations, such as the Mars Hotel, located at the present day site of the Moscone Center. 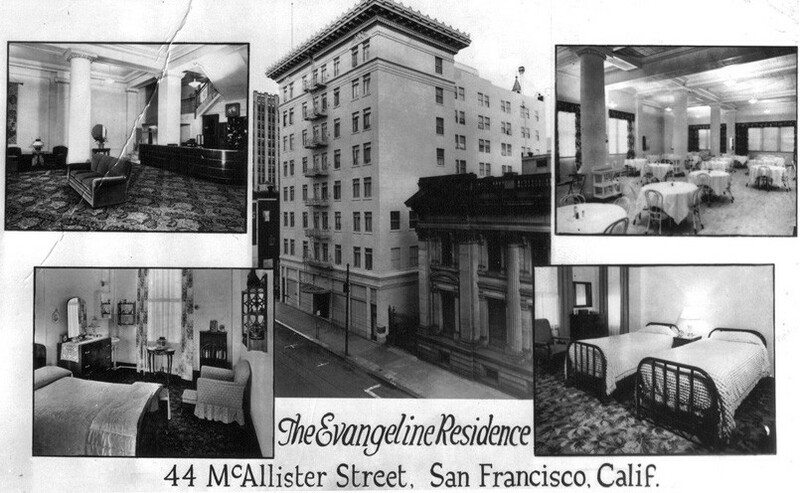 Right: A postcard from the more upscale Evangeline Residential Hotel, on McAllister Street, circa 1930. 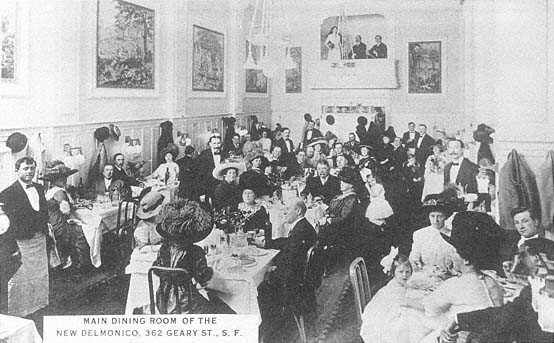 Residential hotels were especially popular in San Francisco. The Gold Rush, the end of the Civil War, and waves of immigrants flowing from Europe and Asia created a huge demand for migrant worker housing. At first, the hotels were mostly for men, but as they became an integral part of the city’s housing landscape, they accommodated other segments of the population, including women and the aged. The hotels appealed to people who did not want, or perhaps could not afford, larger conventional types of housing. But residential hotels catered to more than the roving lower classes. Groth explains that there were “palace hotels, mid-priced hotels, rooming houses, and cheap lodging houses.” Each type appealed to the various socioeconomic circumstances of its inhabitants. San Francisco had the highest concentrations of residential hotels in America. A 1930 US Census survey reported that there were 124 “mainly permanent” hotels and 191 “mixed transient and permanent” hotels in San Francisco (Groth believes there were far more that were unreported). New York, a city with ten times the population of San Francisco, had 146 “mainly permanent” hotels and 252 “mixed transient and permanent” hotels. While the modern definition of hotel implies a transient clientele, hotel residents have always been mix of transient and settled. In a 2006 US Census report, anthropologist Leslie A. Brownrigg wrote that there have been many types of people who chose to live in hotels. There were “residents” who may have arrived by accident, but enjoyed their experience and decided to stay for an indefinite period of time. There were also “sojourners” who saw their stay as open-ended and “temporary” even if they stayed for a long time and had no other home. For rich and poor, mobile and settled, the hotels served an important role in providing convenient, and typically affordable housing, in San Francisco’s urban core. For most of its existence, the residential hotel was in a fight for its life. The concentration of public scorn was aimed at poorer hotels, which made up the bulk of residential housing stock. Catering to low-paid, transient workers, residential hotels typically served as the backbones of cities’ skid rows such as San Francisco’s Tenderloin neighborhood (where most of the city’s hotels are still located). 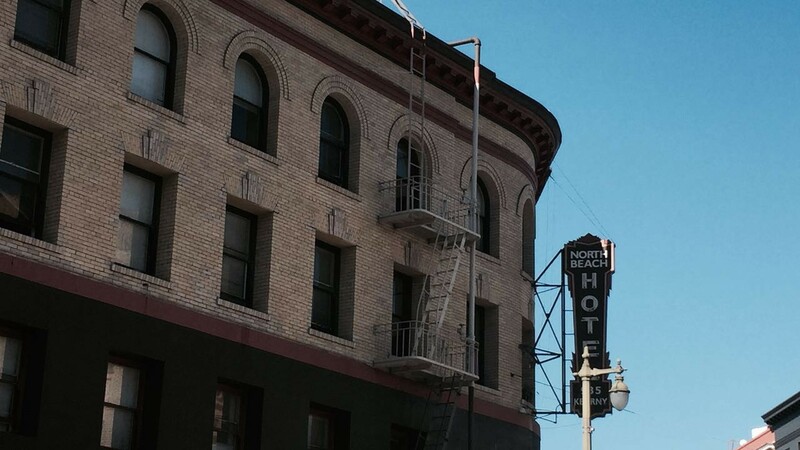 In the 1940s, the hotel moniker was replaced by the term “SRO” (single room occupancy unit). The term became, in some circles, shorthand for housing characterized by poverty and vice. Increasingly throughout the second half of the 20th century, SROs and their residents were seen as barriers to San Francisco’s ambitions for upward mobility. Because their residents lacked political and economic power, SROs became blighted, dilapidated and crime-ridden, making them easy targets for removal. 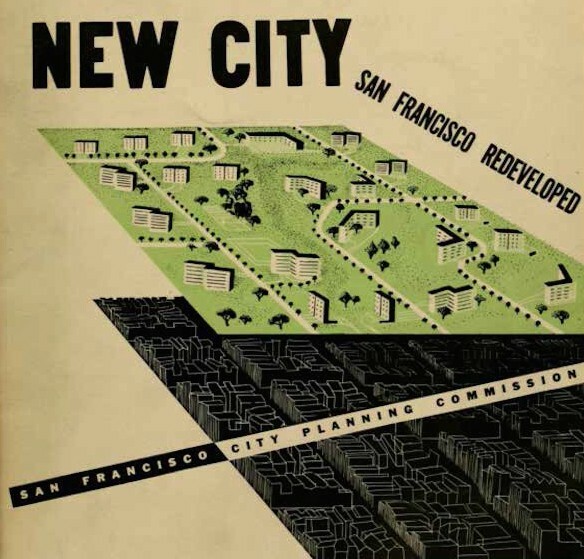 Urban renewal programs razed much of old housing stock in the 50s and 60s in support of a more suburban, car-centric San Francisco. Through a combination of urban renewal and blight removal initiatives, San Francisco removed tens of thousands of residential hotel units. Groth estimates that in 1910 there were 65,000 hotel units available to a population of 416,000. 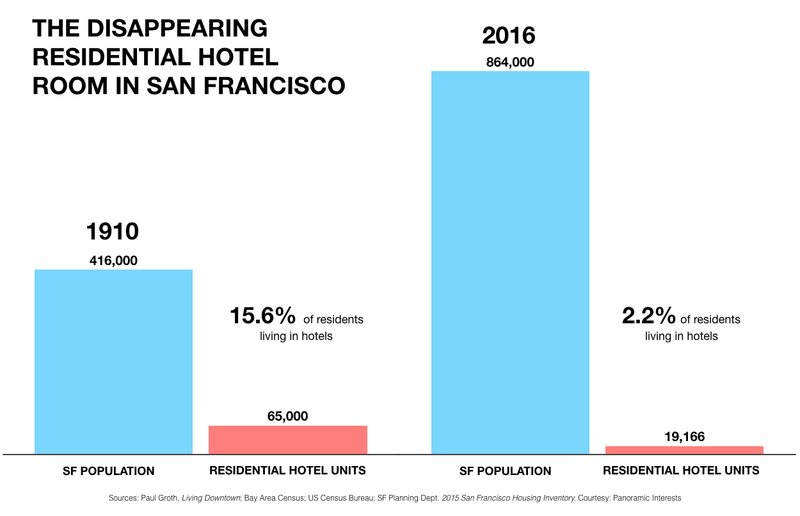 In 2015, the SF Planning Department reported that the number had fallen to 19,166 residential hotel units available to a population of 864,000 — a drop of more than 45,000 units. (See chart below). No comparable housing replaced the lost hotel rooms. Government-subsidized housing and Section 8 vouchers could not cover the extent of the loss. Those most affected by the loss of units were citizens at the lowest end of the socio-economic spectrum. 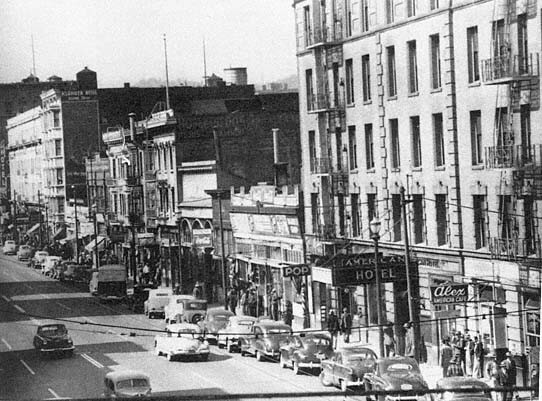 The City’s Planning Department reported that over 6,000 single room occupancy units were lost from 1975–79, and another 1,700 from 1981–88. The loss of these units, combined with an influx of Vietnam veterans, many of whom suffered from PTSD, and massive cuts in federal social and housing programs helped spur the homeless crisis that continues to this day. An exact tally of how many of San Francisco’s homeless once lived in residential hotels is not available. However, the statistics from New York City — which also lost a massive number of residential hotel units in the 70s and 80s — may be illustrative. A 1980 survey found that 50% of NYC’s homeless population had previously lived in residential hotels. But it wasn’t just the city’s poor who were impacted by the lost hotels. For middle class singles, the decline meant the loss of flexible, affordable, basic housing. Those who could afford to do so, moved to individual apartments, burdened by increased costs and less flexible living accommodations. But the more economical, and popular, living arrangement was the apartment share. 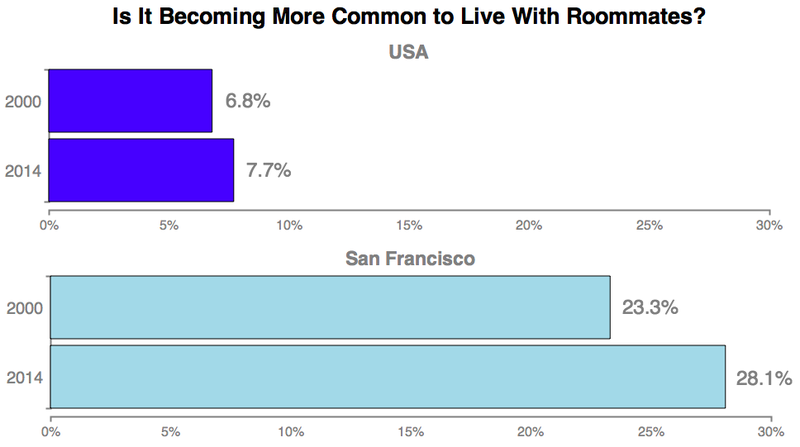 San Francisco has become the roommate capital of the United States. According to the American Community Survey, 28% of San Franciscans have roommates — the highest percentage nationwide. Notably, 20% of that population is over 30 years old. Single individuals sharing apartments can be viewed as an economical, market-based solution for achieving affordability, but the practice appropriates larger housing units, making them scarcer and more expensive for families. A recent study by San Francisco Planning Department found that 70% of homes with three bedrooms or more in San Francisco are occupied by households with no children. The net effect is that families are unable to live in the city at all, or are forced to inhabit housing intended for much smaller households — 25% of the city’s families with children live in single-bedroom homes, studios, or SROs. It is ironic that the single-friendly residential hotel flourished in the late 19th and early 20th centuries. In 1880, the average American household had 5.04 people; in 1900 it was 4.76. The average American household today has 2.54 people, and 27% of the country lives alone. In San Francisco today, 59% of the population is single and 39% live alone. Despite the national pattern of shrinking households and the local trend of single living, the bulk of new construction in San Francisco is large luxury units. Between 2010 and 2015, the overwhelming majority of all apartments were in luxury developments. This trend has left many residents, particularly singles with moderate to low incomes, with few options they can afford. As of September, 2016, the median rent for all San Francisco apartments was $4,500 and $2,950 for one bedrooms. Adjusting for inflation, the city’s rents have quadrupled since 1950. This increase has greatly contributed to 45% of San Franciscans being classified as “rent burdened” — meaning they spend 30% or more of their income on rent. Moreover, 21% of that group is “extremely rent-burdened,” spending 50% or more of their income on rent. The solution for relieving the housing crisis is to build more housing to help close the gap between supply and demand. But it is estimated the city needs as many as 115,000 new housing units just to return to rents of 15 years ago. But no such plan exists. The supply deficit, already bad, is expected to get worse in the near future. Morgan Stanley projects 145,000 new jobs will be created in the Bay Area between 2016–2017, but there are only 15,000 additional housing units in the pipeline. This deficit will likely drive down the already low vacancy rate (around 3%) and push rents even higher. If the city is to provide even a fraction of that needed housing volume, it must find ways of building faster and more economically. One solution for meeting current and future demands is building more micro-apartments. The term micro-apartment refers to apartments smaller than 400 square feet (and often much smaller). They are typically designed for singles. Their small private spaces are often optimized with built-in furniture and supplemented by generous amenity spaces. While micro-apartments are an obvious demographic match for the city’s population, they can be a challenging business proposition. Unit construction costs often go up as dwelling unit size goes down. Smaller units have more framing, plumbing, electrical, and mechanical costs per square foot. These factors make most market rate micro-apartments in urban locations less expensive than conventional apartments, but far from affordable to the average renter. In 2015, for example, a 223 square foot micro-apartment in San Francisco rented for $2,536/month. To make entry-level housing truly affordable, something different and dramatic must be done. Panoramic Interests is attempting to achieve just that with its development of the MicroPAD®. 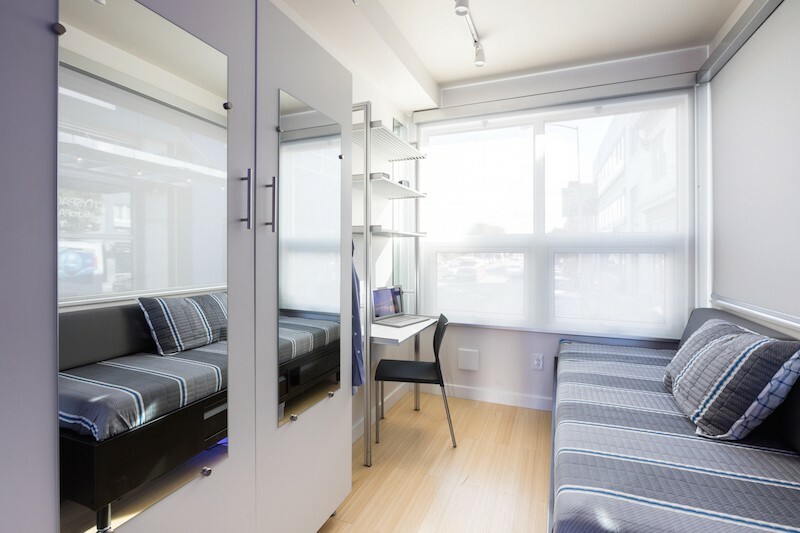 It is a multi-story, modular, prefabricated housing system that meets all of San Francisco’s building and seismic codes and eliminates many of the costly aspects of micro-apartment development. And because of its size, design , and use of technology, the MicroPAD® represents a complete modernization and reinvention the residential hotel. 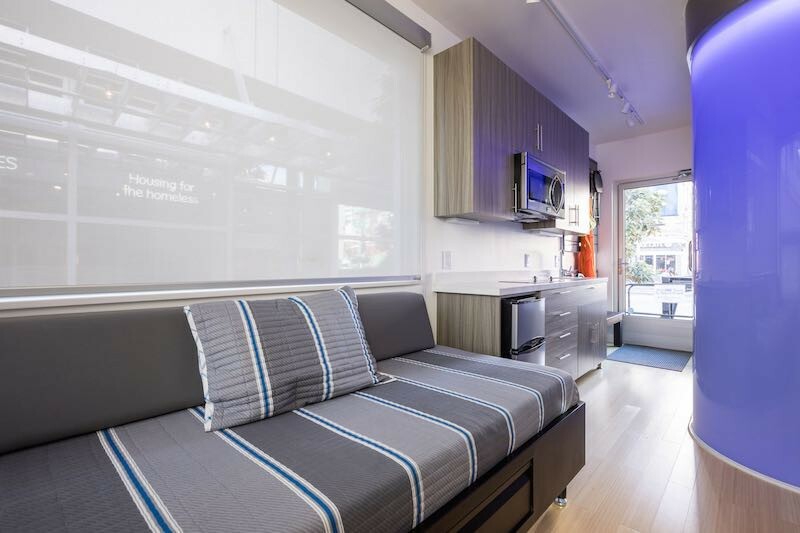 Monthly rent on a furnished MicroPAD® could be as low as $1,000 a month. 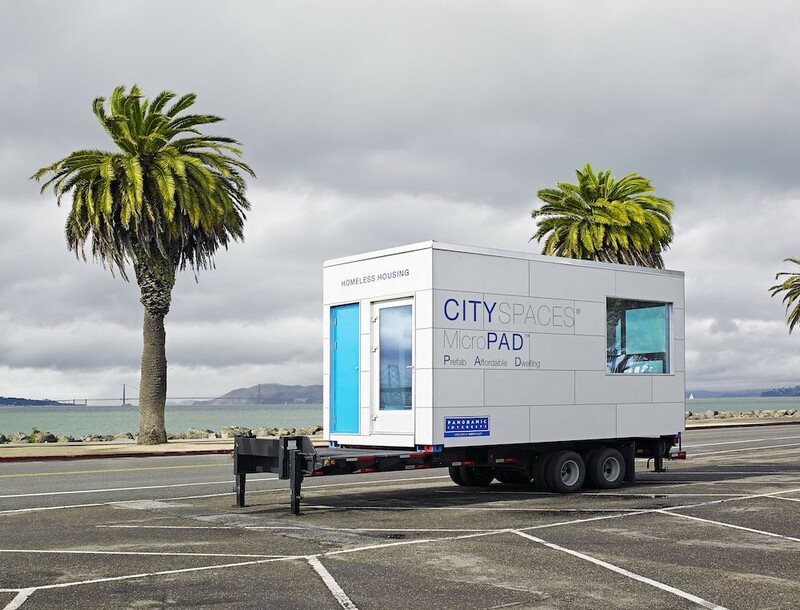 Each MicroPAD module — an 8'x45' steel box-like structure — contains two 160 square foot dwellings. These are stacked like Legos to make multi-story buildings. Unit interiors are delivered move-in ready. Even with site work that includes elevators, facade construction and other site-specific work, the MicroPAD building system reduces development times by 40–50% and offers project cost savings of 30%-40% over conventional development. Though 2/3 of overall construction is done on-site, off-site fabrication of the units themselves allows construction to proceed much faster and irrespective of weather, significantly reducing overall project costs. Modular, prefab construction allows for large quantities of construction materials to be ordered and manufactured specifically for a uniform module type. This economy of scale significantly reduces costs and waste. Systematized construction leads to fewer defects and higher quality construction. 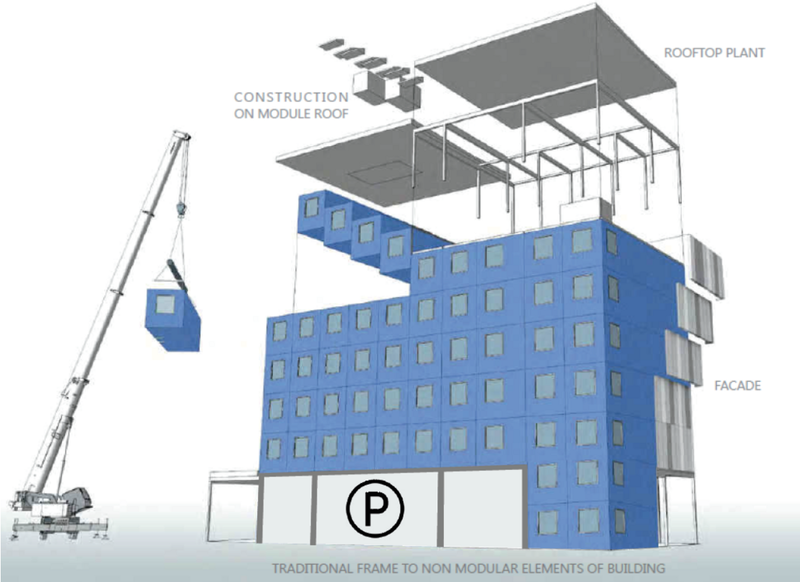 MicroPADs can be stacked as high as 12 stories and built over parking lots , to make use of underutilized air space, further reducing overall development costs. Transportation costs of MicroPADs are lower. One drawback to most modular prefabricated construction is the high transit costs. Large wood framed prefab modules often require special transport permits, costly escorts, and a military-like mobilization. MicroPADs avoid these costs by making modules eight feet wide and compatible with all forms of intermodal shipping. Because intermodal shipping is the most extensive and economical form of freight transport in the world, transportation of the MicroPAD modules becomes a much smaller portion of overall costs. This MicroPAD prototype — which is just for display — contains a single unit. Actual buildings would have modules with two units each, stacked up to 12 stories. 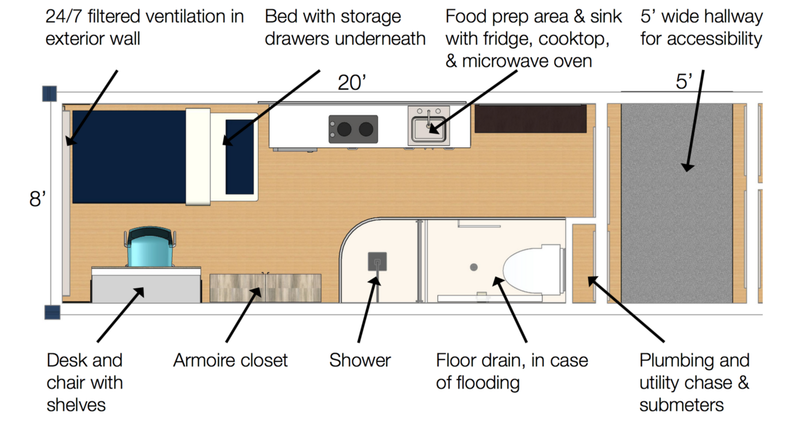 Left: The MicroPAD comes furnished with a daybed with storage, kitchenette, mud room/gear wall and bath. Right: The main living space also features a broom closet, wardrobe, and desk with shelves. The oversized window and built-in air-circulation system provide ample light and fresh air . Left: Each unit comes fully furnished with the features shown above. Right: MicroPADs can be stacked on top of one another as high as 12 stories and built over existing parking lots, preserving the ground floor for parking or other uses. Currently, Panoramic is proposing that the MicroPADs be deployed as supportive housing for the homeless, supplementing and replacing the city’s aging and dilapidated SRO housing stock. But the applications for the MicroPAD system go far beyond the city’s most needy populations. MicroPAD buildings can provide flexible, affordable, and convenient housing for many of the city’s working singles. MicroPADs can fulfill many of the same roles the historic residential hotel once did — but do so in a way that enjoys the latest in building and design technology, making them an ideal fit for the needs and sensibilities of the modern single city dweller. Most importantly, the MicroPAD can achieve all of these ends at a price and scale that has the power to significantly help the city’s housing crisis. The decline of the residential hotel left a considerable gap in the housing stock of San Francisco and other American cities — particularly for singles and those in need of lower cost housing. MicroPADs offer a solution that is efficient, timely and affordable. For more information or to arrange a tour of a MicroPAD, please contact Michael Thomas, michael@panoramic.com, 415.701.7006. Since 1990, Panoramic Interests has been a leader in innovative infill development in the Bay Area.